I actually found this recipe on someone else’s blog (theslottedspoon.com) and tried it out… It is great! I did make a few adjustments, howver… I don’t think it is a super-close imitation of Costa Vida’s recipe, but still something I have made several times. We like to eat it over rice, or in a burrito. It would be good on a green salad too (especially with a Lime Cilantro sauce like Costa Vida has)! Great recipe to make, now that Cinco De Mayo is rolling around! Thaw pork roast. Cut away any large fat chunks (because they will melt and affect your sauce). I also cut my pork roast into large chunks, so it would cook easier. Put pork in a crock pot. Top with chopped carrots, onion, and Serrano pepper. In a bowl, combine all other ingredients, mix, and pour into crock pot. Cook on high for 6-7 hours. 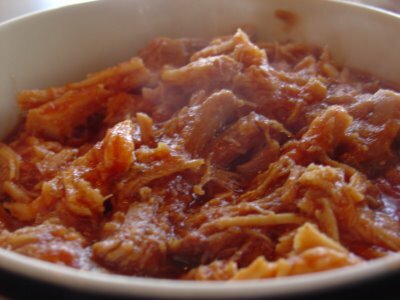 Remove pork and shred. Place pork back into sauce, and stir it in. Serve however you like it best!